Update: This is now confirmed. Breaking news from the other side of the world: Yahoo may well have acquired Maktoob, a leading Arab internet portal that encompasses a variety of services including search, Email, social network, and more. As reported on Arabcrunch (which is unaffiliated with TechCrunch), a press conference announcing the deal appears to be imminent. We’re still working to confirm the news, but there are indications that the acquisition will be officially announced within minutes. 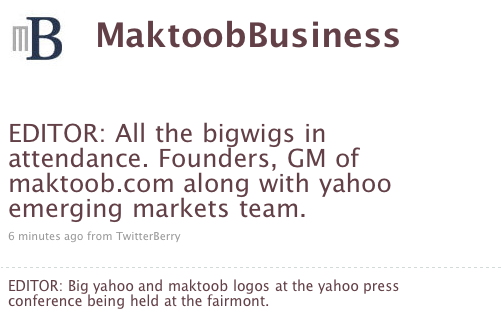 A Twitter account called MaktoobBusiness, which we believe to be affiliated with the company, is currently tweeting about a Yahoo press conference, where founders and the GM of Maktoob are attending alongside Yahoo’s emerging market team. Rumors of a deal between Yahoo and Maktoob have been swirling for many months, but details have remained scant. Arabcrunch reports that the acquisition price exceeds $100 million — we are working to confirm these details. Maktoob launched in the late 90’s as the first free Arabic Email service provider. Since then it has grown to encompass a variety of services, including payments, gaming, search, and auctions. According to comScore, Maktoob has seen very impressive growth over the last year, growing from 6 million unique visitors in June 2008 to 21.8 million a year later. Likewise, its page views have grown from 406 million to 1.1 billion over the same time frame.